Metropolitan of Aleppo and Environs The Rev. Fr. Monk Melki assisted with this translation. The rules of the Old and New Testaments. The pseudo-apocryphal canons of the Apostles including the canons of some local and regional synods. The decisions of the three Ecumenical Councils which were held in Nicea (325 AD), Constantinople (381 AD) and Ephesus (431 AD). The canons quoted from the letters of some famous church fathers who lived in the early centuries of Christianity and other canons prescribed by some church fathers as responses to questions they were asked. Also, the canons of the universal synods which are recognized by the S.O.C.A. after the event of the schism in the year 518 AD, which include decrees and canons enacted by patriarchs on different subjects. Fortunately a large number of these canons are preserved for us in the Syriac language in manuscripts scattered here and there. The Catholicos of the East, Mar Gregorius Ibn Al-Ibri (Bar Hebraeus, 1286) summarized them in his book known as Nomocanon which is the book the church still depends on and considers one of her most important canonical sources. After the time of Bar Hebraeus there were many efforts and numerous legal opinions, but the church had no occasion to enact a constitution, in which to define jurisdiction and how to practice authority, that was because of the difficult circumstances which the church passed through after the thirteenth century. The time of Hulagu (1217 – 1265) was the beginning of the destruction in the Syrian Orthodox archdioceses. Firstly, jurisdiction was significantly changed in its geographical form. For example, many important archdioceses were removed from the church map, other small archdioceses were newly formed, and authority was on many occasions connected to the power of personality of church authorities and how close they were to political power. I don’t want to enter into the details of what happened in the distant past (between the 6th and 18th centuries) so as to show how authority was practiced by the Patriarch to the extent of his jurisdiction and the scope of its effectiveness and his authority within the borders and jurisdiction of the Catholicos, because this subject needs separate research. But after World War I there were many developments forced on the church by political and security circumstances. These were the reasons for the changes of jurisdiction and geographical boundaries many times. The jurisdiction of the Patriarch, which had been limited to a number of Middle Eastern countries and India, was expanded because of the emigration of a large number of church members to the whole world, specifically to every Syrian Orthodox Church which was established on any of the five continents. There is another point that we will not elaborate on here which is the role of laity in our church (which needs separate research) and its authority which fluctuates from time to time and from Patriarch to Patriarch and from metropolitan to metropolitan. The articles of the Synod of Homs in the year 1933 became the basis for what is known today as the Church Constitution. In spite of this brief time many amendments have been made to this constitution by several synods which were held after that date. The last one was the Synod of Damascus in 1991 presided over by Patriarch Mor Ignatius Zakka I Iwas. We will rely on this updated constitution in our paper on the meaning of jurisdiction and how to practice authority in the Syrian Orthodox Church of Antioch these days. (A) (1) The Synod and Its Jurisdiction The Holy Synod is composed of all of the metropolitans and bishops of the archdioceses which come under the Apostolic See of Antioch in the countries of the Middle East, India and the diaspora in addition to the metropolitans who are patriarchal vicars, and the patriarchal assistant in Damascus. The head of the Synod is the Patriarch. From this point the extent of the jurisdiction of the Synod will become clear. Its authority spreads to the extent of the authority of the Patriarch, the metropolitans and the bishops. These decisions are taken whenever two-thirds of the metropolitans meet and the decisions are taken unanimously. (2) The Jurisdiction of the Patriarch The first article from the general rules in the church constitution says that: The Syrian Orthodox Church of Antioch is One, Universal, Holy and Apostolic Church. The old patriarchal headquarters was in Antioch where its See was founded by St. Peter, Head of the Apostles in the year 37 AD and its present headquarters (after 1959) is Damascus, the capital of Syria. The second article says: His Holiness the Patriarch is the supreme head over the church and its Holy Synod. In article 7 we read about the title of the Patriarch: His Holiness Mor Ignatius … Patriarch of Antioch and all the East, Supreme Head of the Universal Syrian Orthodox Church. It is clear from these articles that the jurisdiction of the Patriarch is like the jurisdiction of the Holy Synod: he is the supreme head over the church wherever her sons and daughters are spread, he has the right to be preeminent in the archdioceses that have legal metropolitans and his jurisdiction includes all of the churches whether they are independent or are patriarchal vicariates. Article 5 of the constitution says: The churches and the institutions and the Evangelistic Associations that are not included in the Syrian archdioceses mentioned in article 4, are administered directly by His Holiness the Patriarch. Since the Patriarch is the symbol of unity of the church and the universal father of all Syrians in the world, so it is necessary he be obeyed by the clergy at all levels and ranks, the deacons, the institutions, the active committees and the people altogether. (3) The Jurisdiction of the Catholicos The Catholicos (Maphryono) comes second to the Patriarch in rank in the S.O.C.A. and the Catholicos is elected from only those metropolitans who are under the See of the Catholicate, and he should be obeyed by the priests and deacons and the people in the Syrian Orthodox archdioceses in India. And just as the name of the Patriarch is mentioned in all the archdioceses in the world so the name of the Catholicos should be mentioned in all the archdioceses in India after the name of the Patriarch and before the name of the metropolitan of the archdiocese. According to article 20 of the constitution, the jurisdiction of the Catholicos of the East includes all the Syrian Orthodox archdioceses in India. The Syrian Indian diaspora in the Arabian Gulf area comes directly under His Holiness the Patriarch. 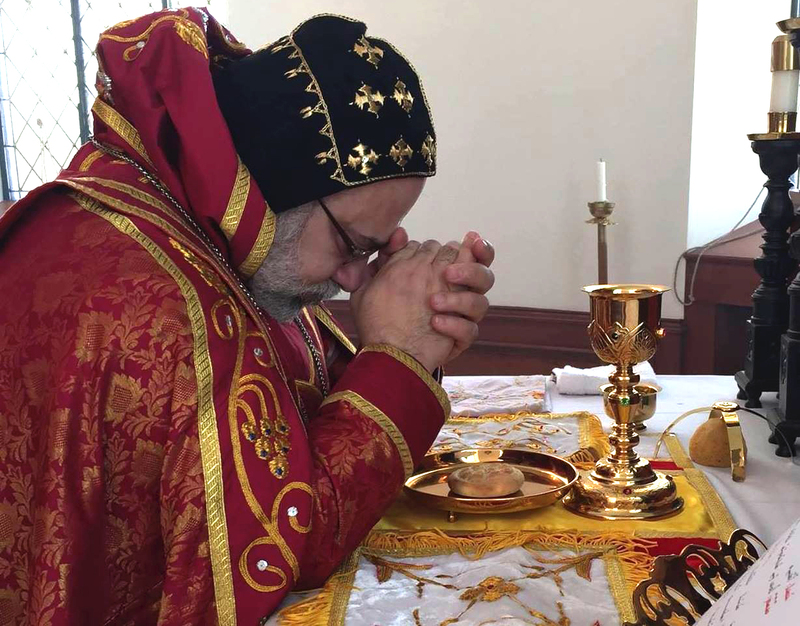 And the Malankara Archdiocese of the Syrian Orthodox Church in North America also comes directly under the Patriarch. The subject of the Catholicate in India has undergone developments recently. Several synods have been held in the patriarchal residence and in India to resolve the causes of the differences and to return to the unity which had tied together the churches throughout India and the Antiochian See. This is another sensitive subject in need of separate research. Great efforts have been made these days for the sake of coming to an agreement between the two factions, by preparing a draft agreement in which we hope will be defined the jurisdiction of the Catholicate and its authority in light of recent developments, throughout this we have had new information on these two topics. (4) The Jurisdiction of the Metropolitan The Holy Synod consists of all of the active metropolitans. An active metropolitan is one who has an independent archdiocese which has its own entity and geographical boundaries, or is a vicar or a patriarchal assistant. The jurisdiction of each metropolitan is defined by the church constitution. The geographical boundaries of the archdiocese could include a whole city or part of it, or a number of cities in a state, or many states in one country, or many countries in one continent. The scope of the geographical area does not necessarily determine the importance of the archdiocese. The boundaries of an archdiocese could be a whole continent as in the situation of Australia but its importance is less than other archdioceses which consist of one city in the Orient. Importance is usually given to the presence of the number of Syrian people, its active institutions and committees and different activities in the archdiocese. 1: Damascus, the Patriarchate, its headquarters in Damascus includes the governorate of Damascus and its environs. 2: Homs and Hama and its environs, its headquarters is in Homs, includes the governorate of Homs, Hama and Tartus. 3: Aleppo, its headquarters is in Aleppo, includes the governorates of Aleppo, Idlib, Raqqa, and Latakia. 4: Jezirah and Euphrates, its headquarters is in Hassake, includes the governorates of Hassake and Deir Ez-Zor. 5: Beirut and Zahle, its headquarters is in Beirut, includes the governorates of Beirut and Bekaa. 6: Mount Lebanon, its headquarters is in Bouchrieh, includes the governorates of Mount Lebanon and Tripoli. 7: Baghdad and Basra, its headquarters is in Baghdad, includes the governorates of Baghdad and Basra. 8: Mosul and its environs, its headquarters is in Mosul, includes the cities of Mosul, Sinjar and Qaraqosh and the northern governorates of Irbil, Tamim (that is Karkuk) and Suleimaneye. 9: St. Matthew Monastery, its headquarters is in St. Matthew Monastery, includes Bartilla, Bashika, Bahsahne, Akra and Mergi. 10: Mardin and its environs, its headquarters is in Mardin, includes the villages of Mardin and Qelleth and the governorates of Diyarbakir (Amid), Malateya, Adiaman and Al-Aziz. 11: Turabdin, its headquarters is in Midyat, includes the villages of Turabdin, Beit Zebde, Nusaybis and its villages. 12: Istanbul, it is a Patriarchal Vicariate with its headquarters in Istanbul, includes the governorates of Istanbul and Ankara. 13: Jerusalem and its environs, it is a Patriarchal Vicariate with its headquarters in Jerusalem, includes Palestine and Jordan. 14: The eastern states of the United States, it is a Patriarchal Vicariate with its headquarters in Lodi, New Jersey, includes the eastern states of the United States. 15: The western states of the United States, it is a Patriarchal Vicariate with its headquarters in Los Angeles, includes the western states of the United States. 16: Canada, it is a Patriarchal Vicariate with its headquarters in Montreal. 17: Brazil, it is a Patriarchal Vicariate with its headquarters in Sao Paulo, includes Brazil. 18: Argentina, it is a Patriarchal Vicariate with its headquarters in La Palata, Buenos Aires, includes Argentina. 19: Sweden and the Scandinavian countries has its headquarters in S”dertälje, Sweden. 20: The Patriarchal Vicariate in Sweden has its headquarters in S”dertälje, Sweden. 21: Middle Europe and the Benelux countries, its headquarters is in the St. Ephrem Monastery in Losser, Holland, includes Middle Europe and the Benelux countries. 22: The Knanaya, its headquarters is in Chingavanom, Kerala, includes all the churches of the Knanaya in India. 23: The Churches of the See (Simhasana churches) and its headquarters is in the monastery of St. Ignatius in Omalloor. 24: As for the Catholicate of the East, the constitution has delimited its jurisdiction and authority with the following words: The Catholicate of the East, its headquarters being in Muvattupuzha, includes all the Syrian Orthodox Archdioceses in India except the archdiocese of the Knanaya, the churches of the Patriarchal See and the Evangelistic Associations of the East in India and the Honavar Mission in North Kanara, India. It is not possible to add a new geographical area to or remove another from the archdioceses except by a decree from the Holy Synod and by authorization of the Patriarch. For example, our churches in Australia were included under article 5 of the constitution which orders that its administration goes back directly to His Holiness the Patriarch, despite the presence of a metropolitan in it who oversees its affairs as a patriarchal delegate. When it was necessary to make the archdiocese a patriarchal vicariate the Synod studied the request of the clergy, the organizations and the people in these churches. Then the Patriarch issued a decree joining it as a patriarchal vicariate to the list of archdioceses of the Patriarchal See. (B) (1) The Power of the Patriarch and How it is Practiced Today in the Church Who defines the authority of the Patriarch and who can call it into account? And, from where does he have his wide authority in directing the church in its different affairs? Answer: The constitution of the church declares clearly that the Holy Synod has the right to limit or widen the full authority of the Patriarch in light of the canon law of the church and with a majority of the votes, if two-thirds of the active members are attending a legal session of the Synod. This is what happened in the amended constitution of the year of 1991, which widened the authority of the Patriarch in the church. As for the subject of calling the Patriarch to account the article 7.g. (7.e. in English) gives to the Holy Synod the full power to investigate the Patriarch if it is needed, but this matter itself cannot take place unless two-thirds of the members of the Synod present a justified written request to two of the senior metropolitans who are members of the Synod. The Patriarch cannot be judged except by the agreement of two-thirds of the members of the Synod. Regarding this matter the constitution says in article 108. d. (108. h. in English) as follows: The Holy Synod issues its judgement on the Patriarch according to the adhered to rules and canons of the church by more than two-thirds of the members who are present. As for the other third, if they cannot attend they can express their opinion in writing and if he was condemned and discharged from his office the Apostolic See shall be considered vacant. In this case the articles pertaining to the election of a locum tenens will be implemented then and the election of a new Patriarch according to this constitution. 3: The staff which the head chief clergy are holding onto – each one by the level of the order by which he became a metropolitan or a bishop – one after another takes the right hand of the patriarch elect and raises it up over all of their hands by this it is made clear it is by the free will and agreement of the whole church that he is given full authority over all the orders of the Holy Church of God. For this reason he himself writes and reads what he has written according to the canon. This means his announcement embracing the constitution of the creed as is fitting to him, that he will behave well in justice and uprightness, walk or act according to the apostolic canons, accept the famous fathers and the three Ecumenical Councils, refute the heretics and dedicate himself to work and sacrifice for the safety and continuance of the Holy Church of God. He will also reconcile between two disputing adversaries in whatever promises are needed. He is never obliged to say: That he obeys an order of any of those who are ordaining him as they are obliged to submit to his order. The act of kneeling down by the head of the synod and all of the metropolitans who are with him on the ground before the one to be elected and the head of the synod says to him: The Holy Spirit is calling you to become Patriarch, the father of the heads of the city of Antioch and to the whole jurisdiction of this Apostolic See, I mean the father for all of us. In return for that the one elected for the patriarchal see kneels before the synod and says: I have agreed and accepted. Surely there is no ordination liturgy for the Patriarch but there is an enthronement rite. The one elected Patriarch does not take a new rank in the level of the episcopate. He becomes the first among the metropolitans and bishops, and with calling him Patriarch his name remains the Bishop of Antioch. The boundaries of his jurisdiction and his direct authority in his archdiocese is the patriarchal residence which has been determined by the Holy Synod. The church constitution defines the authority of the Patriarch as follows: In pastoral affairs: The Patriarch carries out apostolic visits to the archdioceses and churches within the jurisdiction of the See of Antioch at least one time every five years, checking up on their affairs and giving comments on what he sees is necessary. He holds to account the metropolitans and bishops of the archdiocese, the priests, the community committee and all the organizations. He has full authority to dispatch clergy in church and cultural missions like attending conferences of an ecumenical, cultural or church nature. If there are vacant archdioceses the Patriarch appoints reliable clergy for administration of pastoral affairs until a metropolitan is legally elected for it. And in return for that, all archdioceses and churches present a yearly tithe which is known as “zedqe” that he is entitled to from the financial accounts of the archdioceses. Or, it is gathered in the name of the patriarchate in a way which the archdioceses deems appropriate. This practice still exists in some of the archdioceses. On the subject of faith: The constitution names the Patriarch as the protector of the faith of the church, her holy dogmas, doctrines and her apostolic and patristic traditions. Accordingly, it is included in his authority to investigate, correct and scrutinize all books and articles considering the matter of faith in them and giving his comments. He has the right to permit publication or to forbid printing and distribution. He also has the right to delete or enter new church premises. Here we notice that although it is one of the Synods powers to watch out for religious heresies, contradictions of church traditions and its organizations and condemn those who commit them whether they are clergy or laity with all the sanctions of the church, the Patriarch as the head of this synod carries out this decision. Therefore His Holiness the Patriarch is called: defender of the faith. In the ordination of priests: the Patriarch has the right to put the monastic cowl on those who have the qualifications from both genders, and to ordain males as priests and to appoint them as it is necessary in appropriate roles. He also responds to the invitations of metropolitans and bishops or archdioceses to ordain others to the priesthood or deaconate. As for the archpriests he elevates them, or the metropolitans elevate them, by his order. The ordination of the legally elected catholicos or metropolitans remains one of his authorities and rightful powers. By his order, or in the case of the vacancy of the See, one of the metropolitans can do this if he has been the dean of the Synod or the oldest of the metropolitans by age. Right after the ordination, the Patriarch provides them with the Sostateequn and that is the document which defines the jurisdiction and authority of the new metropolitan in light of his service, whether it is a legal archdiocese or patriarchal vicariate. And with this document the metropolitan is endowed with patristic instructions and apostolic advice as he calls the clergy and laity to take care of their new metropolitan. It is within the authority of the Patriarch to approve the election of metropolitans who are under the See of the Catholicate directly after election. Then he grants the new metropolitans with the document Sostateequn after their ordination by the Catholicos and his metropolitans. On the rest of the Sacraments: The Patriarch, if present, takes the lead in the liturgy except in the sacrament of Holy Oil (Morun). The Patriarch alone has the right to specify the time of the consecration of the Holy Oil (Morun). Its consecration is done under his leadership and in his presence, with the assistance of two of his metropolitans, at least, or one metropolitan in case of dire necessity. The affairs of organization and administration: The Patriarch has the right to establish relationships between his church and other churches, to negotiate with them on ecumenical affairs, to sign common statements or bilateral agreements and to visit the worldly authorities wherever he is to discuss church affairs in general. He is the one who signs for all documents, contracts of all kinds, records and letters related to the affairs of the See. He announces the decrees of the synods, the election of the Catholicos and metropolitans and he transfers metropolitans from one archdiocese to another. After taking a decision in the synod his authority gives him the right to receive resignations from the catholicos or metropolitans, and to implement their dismissal. He also orders the correction of geographical borders of the archdioceses. He announces the foundation and establishment of archdioceses or their abolishment, sells part or all of the properties and the endowments of the patriarchate. He has the authority to call for a holding of the Holy Synod and to set the time and the place. Concerning the church’s court: The Patriarch is the authority to refuse or approve any of the judgements issued by any preliminary court in the countries of the Middle East and the diaspora, and to appoint the head of the court of appeals in the patriarchate or in any other country. He has the right to appoint the head of a preliminary court in the patriarchal vicariates wherever they are found. He also has the right in case of the removal of one of the heads from his position in any spiritual court in the archdioceses to deputize another person for a short time in that case. The Patriarch alone is head of the high court in the church and is the highest level in the churches’ courts and his decisions are legally valid and are not able to be appealed. This is for the subject of personal affairs. But on the subject of church punishments in the lower levels, the Patriarch does not interfere in the rights of the metropolitan or archdioceses but he should be informed of the matter. The subject of church excommunications remains entrusted to the Patriarch and after examination of all of the aspects of the case he will issue a judgement of excommunication on the clergy or the laity and will announce it by known media. We still have to point out that Syrian monasteries including monastics (men and women) and the theological seminaries which include the seminarians, their affairs, taking care of them, preparing them educationally during their stay in the seminaries or sending them for research studies abroad in the theological colleges in different parts of the world, and the printing and distribution of books, magazines and publications in the patriarchate: All are entrusted to the person of the Patriarch and are within his authority. (2) The Authority of the Metropolitan and How it is Practiced in the Church Today The election of the metropolitan has changed in the Syrian Church between the past and now. While in the past the archdiocese chose three monks from among the monks. The Patriarch and his synod chose one of them to be the metropolitan for the archdiocese. But, now the Patriarch selects and suggests three candidates from among the monks and the archdiocese chooses one of them. According to the constitution of 1991 the Patriarch must necessarily confer with the members of the Holy Synod about the monks who are candidates and if he gets a majority of the votes he ordains him. This plurality of authority puts the archdiocese in a bind sometimes but most important is that the metropolitan of the Syrian Orthodox Church (except for the patriarchal assistant and the patriarchal vicariates whose names are suggested by the Patriarch and they are appointed by him) is elected by the clergy and believers in the archdiocese. If it is impractical for the believers to do so: Then the clergy of the archdiocese and the community committees and the organizations of the church and the active committees elect him. Then the metropolitan will stay at the head of his archdiocese as long as he remains in good health, does not desire resignation and is not more than 75 years of age when he is to retire. This last point is a new article in the revised constitution of 1991, for article 62 says: The metropolitan has the right to present his resignation to His Holiness the Patriarch or to retire at 70 years of age. He must necessarily retire at the age of 75. His authority is manifold and various, for the metropolitan holds prime responsibility in the archdiocese, organizes its different affairs and is helped in that by two committees: First, by the laity known as the board of trustees (community committee), for in the committee the metropolitan has an assistant who deputizes for him in the administrative sessions in the committee during his absence according to the bi-laws of the community committees. This committee has a long history in the Syrian Orthodox Church of Antioch. It is clear from different stages that laity has a great role in the life of the church. If we look at the powers of the committee from the organizational, the social and the financial side we find they are many. All of these powers call for the raising of the level of the archdiocese, to support her unity and preserve her rights. The community committee has the right to preside over the different kinds of activities of the organizations of the archdiocese, to enact suitable bi-laws for them, to call them to account, to supervise them, to look into the affairs of its committees, to change them or they will be disbanded if they commit something wrong which is against what the committee has issued and to intervene and resolve differences between the leaders and members of the administration of these organizations. The community committee takes care of the cultural and educational movements in the archdiocese and they have the right to oversee in the peoples’ voting to choose a new metropolitan and priests for the archdiocese and all of the financial affairs are within its domain. Although the committee has special, different smaller committees, and its meetings are considered legal if more than half of the members are present, the new article of the bi-laws of the committees approved that the decisions of these committees will be considered null and void unless the metropolitan of the archdiocese is present. This new article in many cases hinders the working affairs of the committee. So, it makes it necessary that the metropolitan always attend to help these lay organizations in determining the administrative affairs in the archdiocese. As for the committee of clergy which includes all of the priests of the archdiocese headed by the metropolitan, it is to oversee the spiritual affairs of the metropolitanate. This committee has no bi-laws, and does not take any executive decisions. Its task is limited to studying the spiritual affairs in the archdiocese, developing the activities of spiritual services, treating some of the problems in light of the teachings of the gospel and the canons of the church and putting forward their findings to whomever it may concern. This clarifies the authority of the metropolitan: Pastorally, the archdiocese is always looking after the members of the metropolitanate, blessing their homes, looking after their affairs, receiving them in the metropolitan’s residence, meeting their needs as he is able. Regarding Sacraments, when he is present he heads spiritual services in the metropolitanate. He alone has the right to build and to renovate the churches and the altars in the metropolitanate. In article 59: No one has the right to build or to renew a church or altar in the church except by the order of the metropolitan of the archdiocese. He alone has the right to consecrate the churches, the altars and the vessels used by the celebrant in them. He also ordains the priests and the deacons. He administers the sacraments and the Holy Oil for the baptism and the anointing of the sick. And it is within his authority to shift a priest from one church to another within the area of his metropolitanate. He has the right to punish deviating clergy and laity through the church’s discipline and informs His Holiness the Patriarch giving the reasons that necessitated the punishment. It is also within his authority to take care of the affairs of the archdiocese administrationally, financially and educationally. He is the one who holds the official records to register in them events like baptisms, engagements, marriages, deaths, and wills and all of the contracts and bequests and to preserve all of these. He presides over and approves the yearly budgets of the archdiocese and he establishes the schools and he oversees the publications and the circulations in his metropolitanate. He establishes the organizations, committees, clubs and all of the community associations. Article 60.d. (60.i. in English) says: Any of these committees that is not approved by the metropolitan is null and void. Another authority of the metropolitan is overseeing the affairs of the archdiocese, making sure they don’t go against the constitution of the church, because he is responsible before the Patriarch and the Holy Synod concerning deviations from the church constitution in his metropolitanate. He has the authority in this matter to announce and implement the decisions of the Synod within the boundaries of his archdiocese and to prepare a detailed written report about his archdiocese for His Holiness to show to the Holy Synod in its usual and exceptional sessions which he personally attends. 1: He does not negotiate with heads of churches, other religions or other religious organizations about spiritual or church affairs without the permission of His Holiness. 2: He may not lend, borrow, grantee or take a grantee on or rent the endowments of the archdiocese, the churches, the organizations or the charitable associations without a decision of the local board of trustees. 3 — He does not bet, exchange or sell any of the archdiocese’s endowments, churches, organizations or charitable organizations except with a decision from the local community committee and by the approval of His Holiness the Patriarch. It remains to be pointed out that he alone in the archdiocese has the right to preside over the preliminary court sessions of first order and to choose whoever he prefers from the priests and the laity to be members in the spiritual court. He alone has the right to take suitable decisions according to the proceedings of the case and in light of the church canon law and execute them according to the personal statutes canon except for the decision regarding the dissolution of marriage or divorce, for that decision cannot be taken without the approval of the Patriarch. In the situation where he is chosen to represent the Patriarch or the Holy Synod in an important church matter, whatever it is, when he returns to the archdiocese he must write a detailed report about the task he was delegated for. Just as nobody can interfere in the administrative, organizational, spiritual and financial affairs, except as permitted by the constitution, so he has no right to interfere in the matters of another archdiocese nor to take part in practicing or carrying out any church services in it except by permission of the head of that archdiocese and by his satisfaction. If he ordains someone in it, it should be considered as invalid and the Patriarch and the Holy Synod will look into the matter. 1: elect the Patriarch and enthrone him in the patriarchal residence at a suitable time and to receive the resignation of the Patriarch and the metropolitans and to order their dismissal. 2: to agree on or to reject the decisions of the Patriarch to candidate the monks for the rank of episcopate in the case of their election and appointment. 3: to investigate the Patriarch and the metropolitans and to judge them according to canon law. 4: to look into the religious heresies which are against the faith and traditions of the church and its by-laws and to issue judgments against whomever committed them, whether clergy or laity, with all of the punishments of the church. 5: to meet, presided over by the oldest metropolitan, if the Patriarch has not called the Synod for three successive sessions. 6: to shift Metropolitans from one archdiocese to another and to establish, to renew and to abolish archdioceses or to change its geographical borders or to sell a part or all of the endowments of the Patriarchate. 7: in case of a vacancy in the See, the Synod is to elect one of the metropolitans as an interim authority according to the principals and articles of the constitution. This could be enough but I allow myself to add three notes on these two subjects: jurisdiction and authority. 1: The present situation cannot be compared to the distant past, for most of the sees and metropolitanates which were at one time included in the jurisdiction of the See of Antioch and were under the decisions of the Holy Synod are not present in this time. According to two ancient Syrian manuscripts it is clear that seven sees were under the See of the Antiochian Patriarchate and they were: (1) Aleppo, (2) Kanasreen, (3) Jebleh, (4) Sulokiah, (5) Hansarta, (6) Bloutoan, (7) Al Jabul. And there were two other sees in which the Patriarch had the authority to send their metropolitans wherever and they are: (1) Salameia, (2) Brakusun. Four other sees were independent and they are (1) Beirut, (2) Homs, (3) Latakia and (4) Khorus. The number of metropolitanates which were under the Holy See were twelve: (1) Tyre, (2) Tarsus, (3) Al Ruhra (Edessa/Urfa), (4) Aphamia, (5) Manbej, (6) Bosra, (7) Ain Zerba, (8) Sulokia/Isauria, (9) Damascus, (10) Amed, (11) Rasafe, (12) Dara. For each metropolitanate there were many archdioceses. 2: The title metropolitan, bishop, archbishop or episcopus all have been raised to the level of Episcopate. Each metropolitan is an archbishop and a bishop and an episcopus. The episcopus at this time is a widowed priest who has been raised to the level of the episcopacy. The article 91 of the constitution says as for the episcopus he is chosen from among the widowed priests and the garb of the episcopus is not to be different from that of the metropolitans and his rights are equal to their rights. But, he is always last in rank in the Holy Synod even if he was ordained previous to another.